Another one from the big box of junk. This build was pretty straightforward. 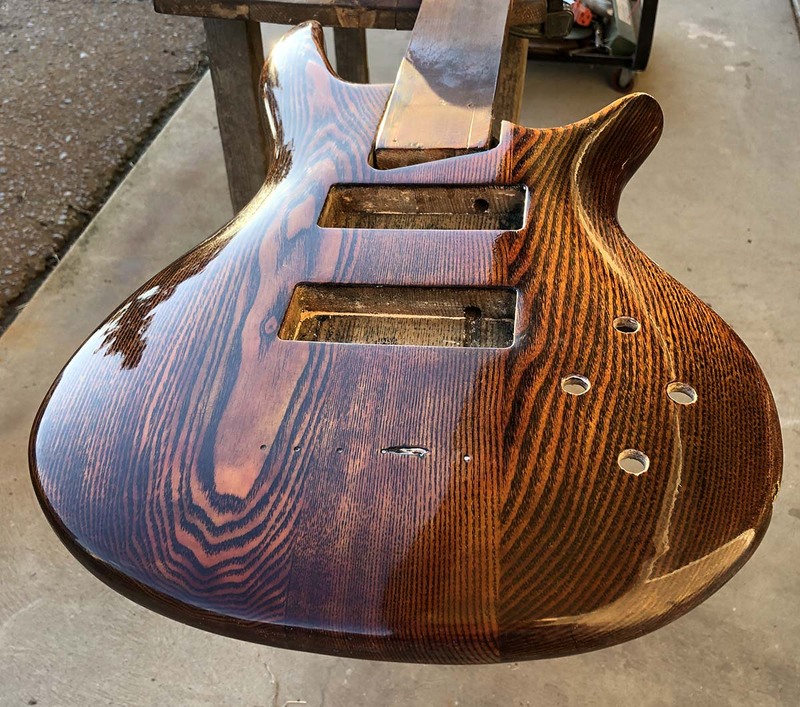 Finish body and neck, assemble, set up, play. At first, I thought this was an old Ibanez 505. But now I think it is one of the "Ibanez style" kit bodies. The fretboard is composite, and the arrangment of the control knobs and input jack don't match anything except a 1996 Ibanez 505. 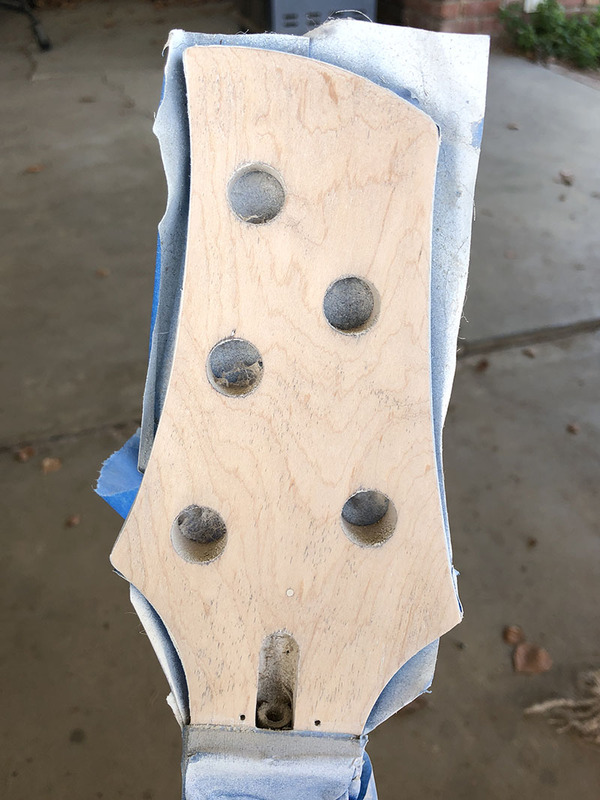 There were no screw holes in the pickup routes, and the neck has never been mounted. So unless this was a spare body and neck that sat around for 20 years, I'd guess kit body. 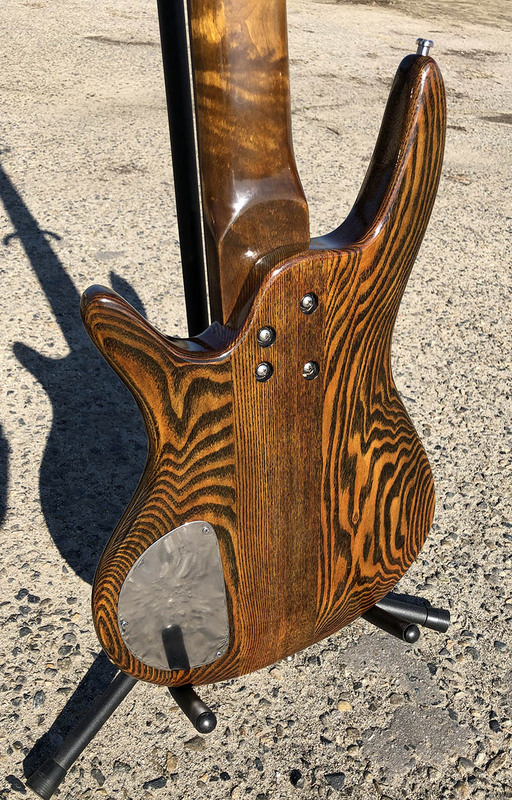 I've seen a few online with similar figured ash bodies, too. I bolted on a working handle, got to sanding back the blotchy green dye job to clean (mostly). 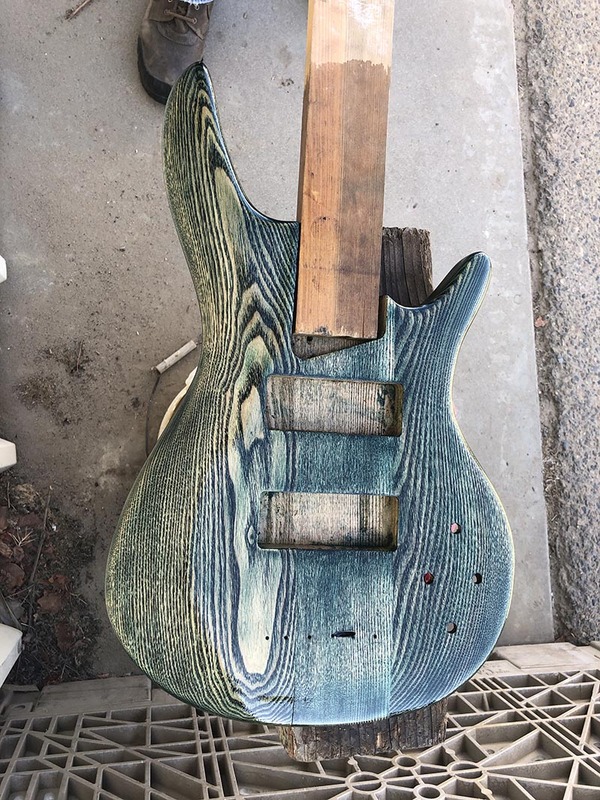 No, I'm not going to be "green bass guy". So, the green was deep in the grain. I sanded back pretty far then grain filled with black. That covered up 98% of the green. Since the box of junk bodies are all silicone contaminated, I've been using a lot of shellac. On this body, to combat the residual green, I used a 1.5# cut of garnet shellac. I started at 1#, but added a more flakes halfway through. The redish tone knocked the green back to brown (red + green = brown). I'd been using Zissner shellac, but they stopped putting sell-by dates on their cans. Who knows how long it sat on the shelf at Home Depot? So I bought a couple bags of flakes, ranging in color from light blonde to dark garnet. The stuff is awesome to work with. You only have to mix what you need, and since the solvent is 190 proof alcohol, I could do wipe on coats inside (it's winter now). I ended up doing about 6 or 7 wipe on coats of 1.5# cut garnet shellac. I could do several coats a day. Fresh shellac dries real quick (5 minutes). Green. Green sanded off, filled with black, and sanded back again. Garnet shellac. 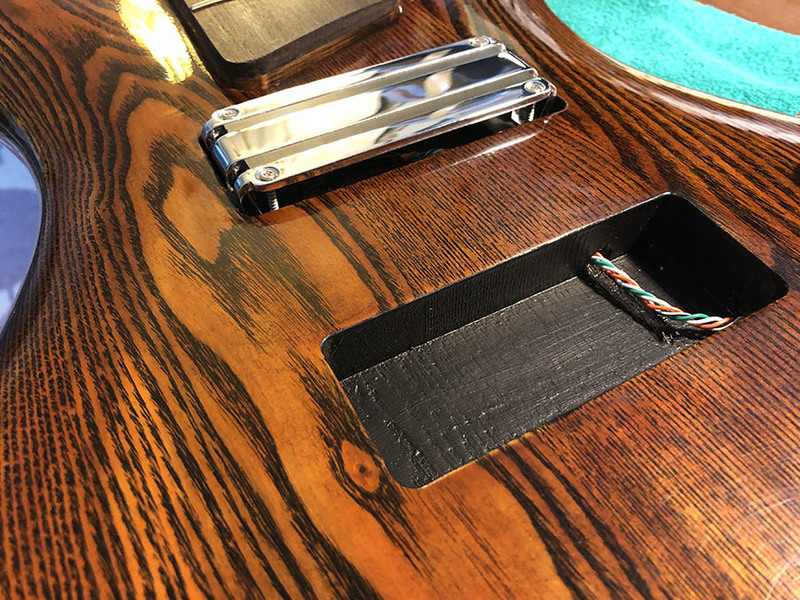 I leveled the shellac to dead flat, then sprayed nitro lacquer. 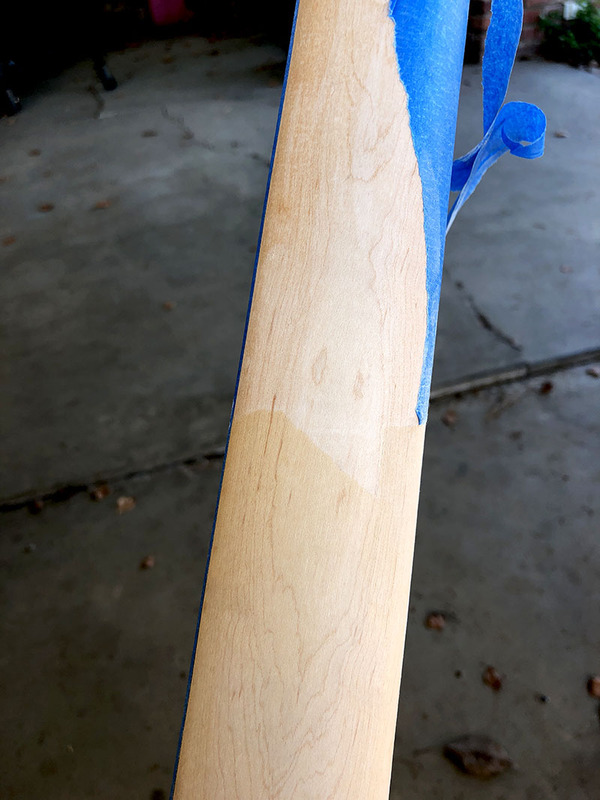 I had a pretty good layer of shellac on the body so I only needed about 5 thin coats. The shallac did the job. completely sealing off any contamination. 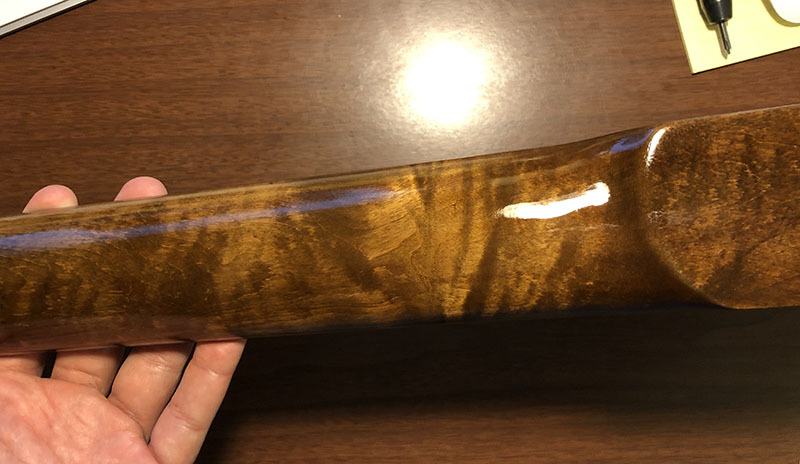 Lacquer job came out nice, too. Here it is after the final buff and carnuba waxing. The neck had thousand year old masking tape on parts of it. When I peeled it off, the untaped areas were pretty sunburnt. No telling how long this sat around, half finished. 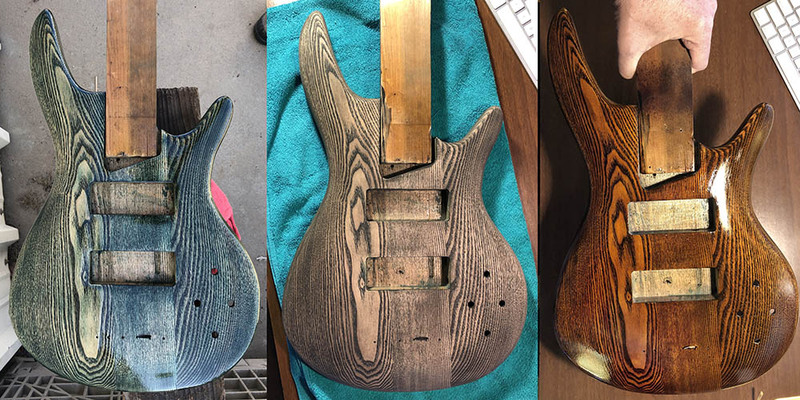 I wanted more matchy/matchy on the neck a body, even with dissimilar woods, so after sanding out the sunburn, I gave the whole neck, front and back, a wipe down with iron acetate to darken up the grain, sanded it back, and wiped on a few coats of the garnet shellac. 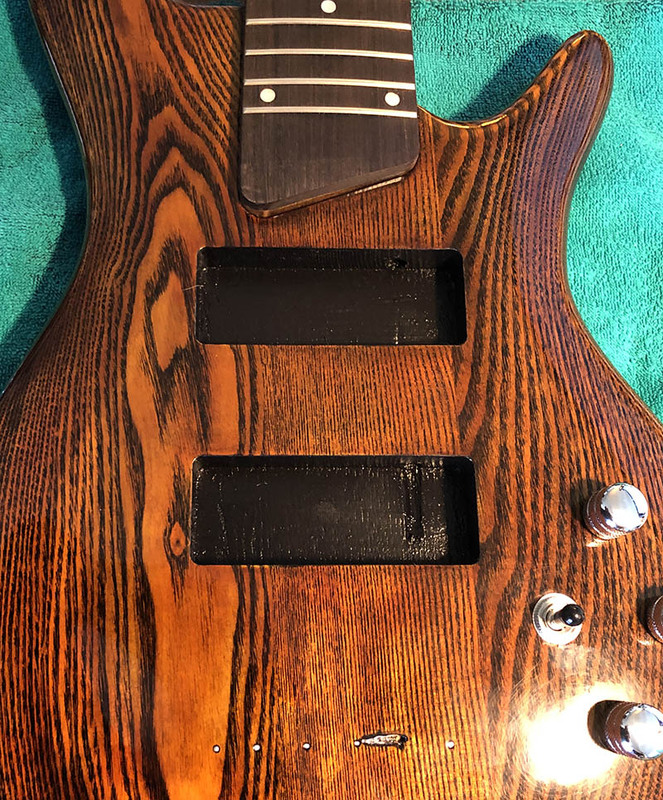 The iron acetate immediately discolored the frets (but tuned the fretboard nice and dark), The maple darkened up quite a bit and the grain stayed dark when sanded back. The fret job on this neck was not great. They -looked- good, but had never been leveled. Also, one of the frets down by the body had a big dip in the middle. I pulled it, fixed the dip and reset it with a bit of glue. Then I leveled them, polished them up. Took a while, there were a few poorly set frets that needed a gentle tap or two. In the end, everything came out smooth and level. The headstock is typical late 90's Ibanez style. Horribly layed out. All five strings break well off to the bass side of the headstock. There was a layer of flat white primer, and then some residual black, which took a while to sand clean. In the pic, it's not quite there. It came out ok, though. The truss rod access cover was missing so I made one out of steel. 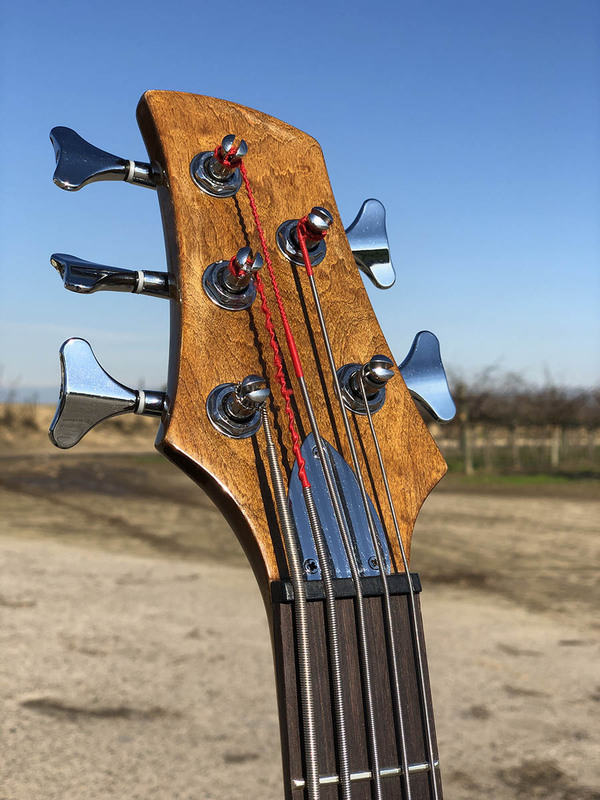 Tuners are generic sealed tuners, found on 90% of the modern basses made. Ibanez, too. Time to bolt on the neck and... somebody drilled the screw holes in the neck too big. Nice. I picked up some steel 10-32 threaded inserts (for soft metals), drilled and tapped the holes, screwed them in. They come with a blob of epoxy putty smeared in the threads. I wiped it all out and coated them with a bit of wood glue instead. 10-32 is a pretty big insert, but this is a 5 string bass, so I wanted somethnig I won't have to think about. The body was countersunk for screw bushings and oval heads, but since I was using 10-32 bolts instead, I went with a thick SS washer and then a lock washer. It screwed down very solidly. I'll probably do this to all the basses and guitars I build from now on. So nice not worrying about stripping out a wood screw during the final few turns. I'd use 8-32 on a guitar, though. 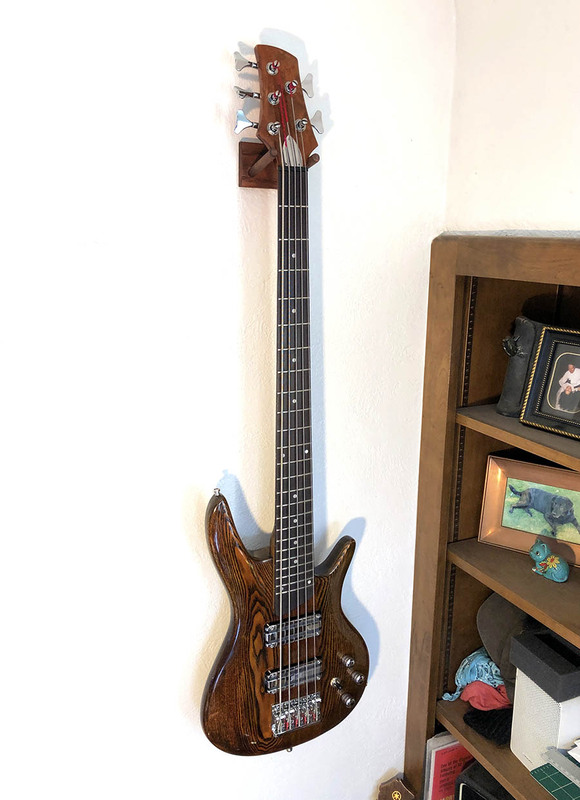 A set of 4" Alumitones Bass Bars fell into my lap, and they just happened to be the exact size of the soapbar routes (EMG 40's) in this body. I have a pair of soapbars, somewhere, but they're active pick-ups, and I could only locate one of them. Also, I didn't feel like popping for a preamp, and, this bass isn't routed for a battery box. So, passive it is! The Bass Bars are passive, and cool looking. However, when mounted you can see the route pocket underneath, so I painted the routes black. 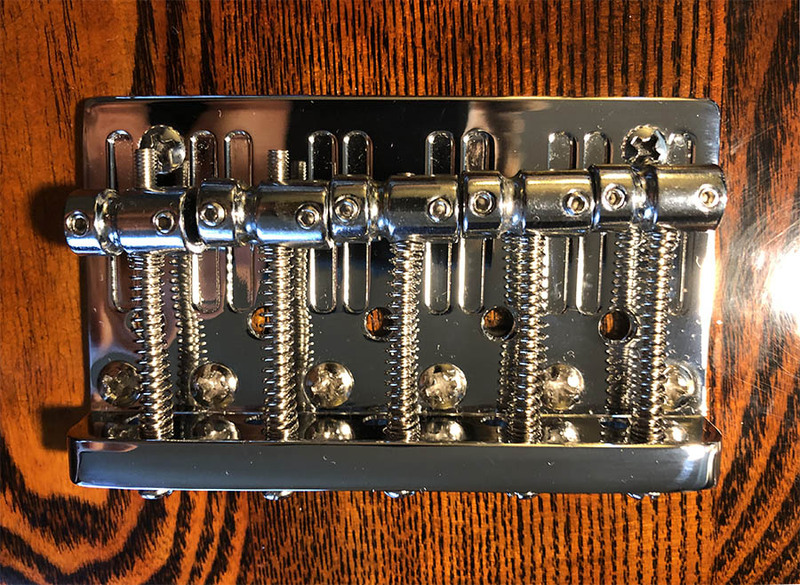 There was no control cavity cover in the box either, so, again, steel, polished up to mirror shiny. 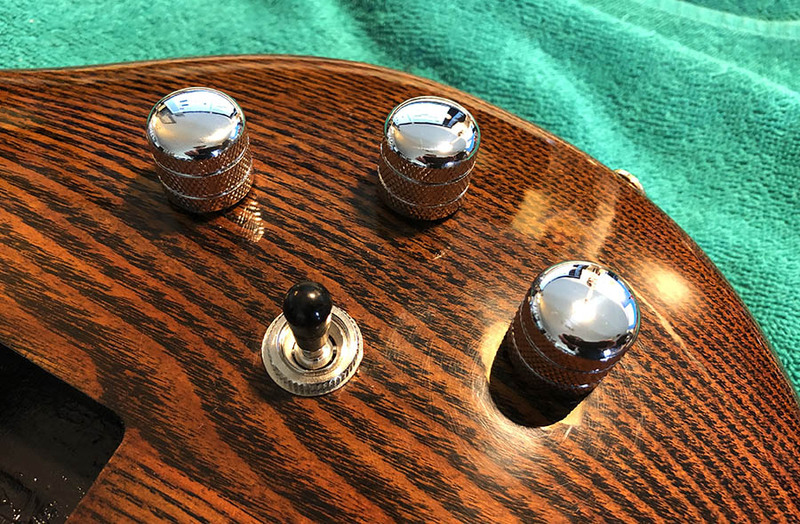 Controls are: 2 volume, 1 master tone (0.047uf cap), 1 3-way pick-up switch. The pick-ups have taps, so I used push/pull volume pots. Pulled up = tapped. The body was drilled for junk small shaft pots, so they were reamed to regular size. Same with the jack socket. The bridge was a generic bridge, found in the bottom of the junk box, still in it's little baggie. It works just fine, but is built offset. In the pic, you can see that the middle string is well offset to the bass side of the centerline. So, the bridge plate doesn't line up with the pickups, it sits about a quarter inch to the treble side. Looks funny. I may change it, later. 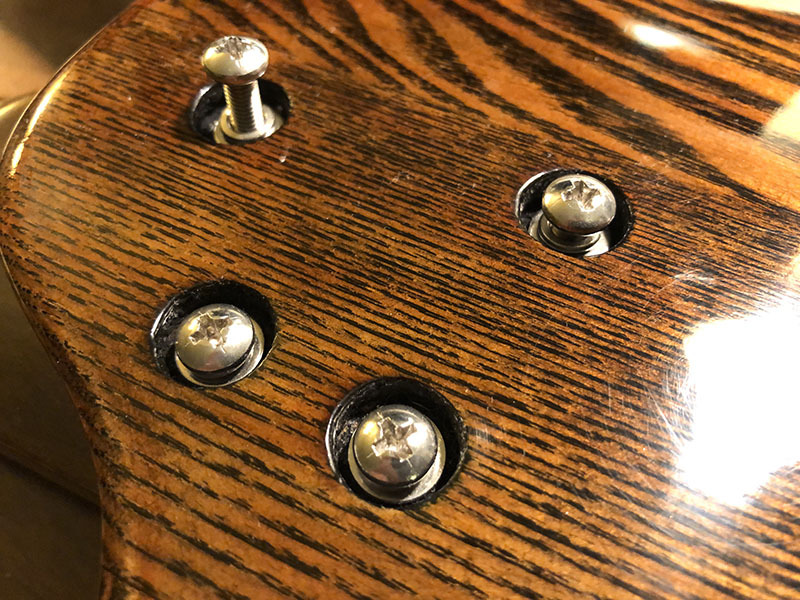 Like the old Fender vintage bridges, this bridge plate needed two holes drilled up front for it to mount with solid body contact. All done. Plays great. Has typical Ibanez string spacing (too close), so it takes a few mintes to get used to it. But then, it's a fast neck for runs and such. Guitar-like. The Alumitones are dead quiet, full power and tapped. They are high output, very clean and very, very even across the frequency range. Bassy, but not boomy, mids are quite present but not in your face, and the highs are clear but not jabbing your eardrums out. Good enough. On to the next one.